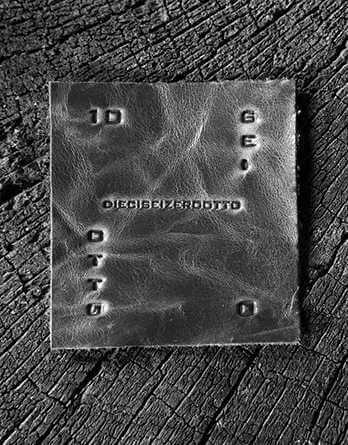 10SEI0TT0 is an Italian fashion brand founded by Paolo Barelli, a leather industry expert and Tiziano Rillo, a talented designer passionate about the creation of fine leather goods who is dedicated to the creation of stylish avant-garde clothing. Driven by the aim of fulfilling the requirements of an ever-evolving and changing market, 10SEI0TT0 clothing inspires fashion conscious customers with their signature contemporary designs. Today, the brand is recognised as a highly regarded manufacturer of premium quality leather goods made in Italy that are produced by traditional methods and the label has acquired a devoted international following. The brand focuses on an artisanal approach with an extremely high attention to detail at every stage of the manufacturing process. Special treatments and finishes give the fine leathers used in the creation of 10SEI0TT0 clothing a unique appearance and precisely crafted metal detailing adds polish to the collection. In the 10SEI0TT0 collection, informality and elegance overlap: these clothes are designed for men and women with a confident and individual sense of style who are not afraid to experiment with fashion. Leather is traditionally thought of as a sturdy, durable material suitable for coats and jackets but the brand is constantly innovating and pushing the boundaries of the craft of leatherworking with unconventional techniques and finishes, for example in sheepskin coats where the inner surface is lasered. They combine natural hide with lightweight cotton and silk with metallic finishes to create covetable, light and fluid pieces that are a delight to wear. By focussing on primary values, these young designers bring a primordial avant-garde sensibility to every piece. In the 10SEI0OTTO men and women collection, you will discover exquisite knitwear, the latest looks in denim, sleek leather jacket and coats, stylish shoes and boots, high quality bags for men and women and designer fragrance to add the finishing touch to every outfit.